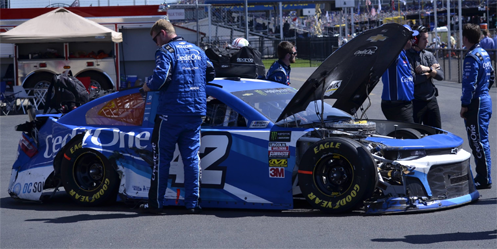 Kyle Larson picked up the 4th last-place finish of his Monster Energy NASCAR Cup Series career in Sunday’s GEICO 500 at the Talladega Superspeedway when his #42 Credit One Bank Chevrolet was involved in a multi-car accident after 71 of 188 laps. The finish, which occurred in his 157th series start, was his first on the circuit since November 12, 2017 at Phoenix, 11 races ago. In the NASCAR Cup Series last-place rankings, it’s the 22nd for car #42, the 564th by reason of a crash, and the 743rd for Chevrolet. Across NASCAR’s top three series, it’s the 33rd for the #42, the 1,137th by reason of a crash, and the 1,591st for Chevrolet. Following his most recent last-place run at Phoenix, Larson finished a strong 3rd at Homestead, serving notice that he would again contend for the title in 2018. This year, following a 19th-place showing in the Daytona 500, Larson has missed out on victory lane, but has shown similar consistency. He finished 3rd at Las Vegas, wrestled 2nd from Kyle Busch late in the race at Fontana, and appeared headed to a dominant victory at Bristol before Busch repaid the favor with just six laps to go. With another strong short track run last week, a 7th at Richmond, Larson entered Talladega 10th in the standings. Larson began the weekend 17th in Friday’s opening practice, then joined Darrell Wallace, Jr. in not participating in Happy Hour. The session’s fastest speed belonged to Larson’s teammate Jamie McMurray, who tangled with him at the end of the Richmond race. Moments later, McMurray’s #1 DC Solar Chevrolet blew a rear tire and flipped six times, collecting both the #31 Caterpillar Chevrolet of Ryan Newman and Ty Dillon’s #13 GEICO Chevrolet. McMurray, Dillon, and Newman would be sent to the back on Sunday, all of them for backup cars. Larson, meanwhile, ran 22nd in Round 1 of qualifying with a speed of 190.943mph (50.151 seconds). Starting last on Sunday was Aric Almirola, whose #10 Smithfield Ford had one of the rear brakes drag during qualifying, sending him into a spin in Turn 1. 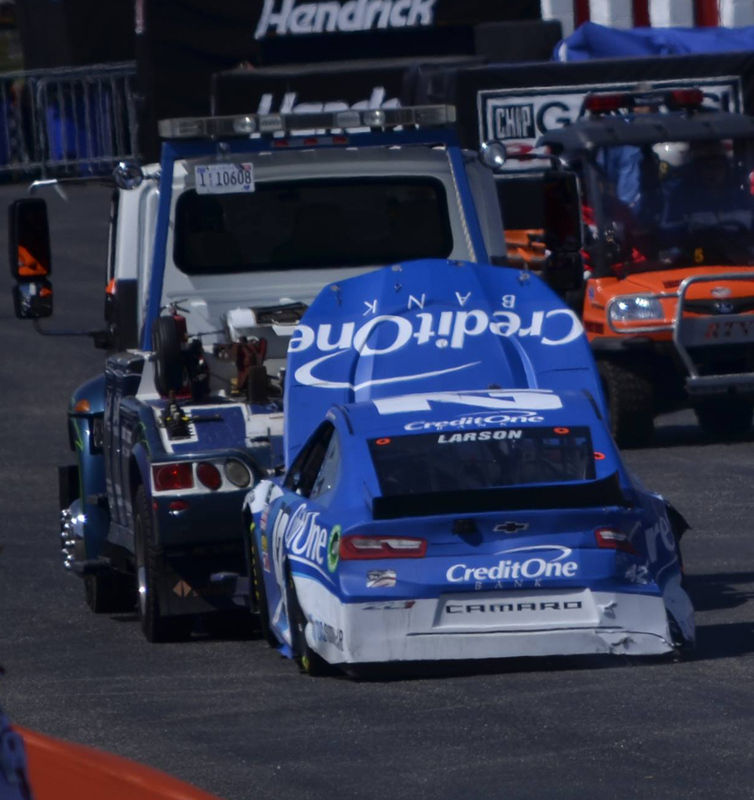 Repairs led to Almirola being incurred a redundant tail end penalty along with the backup machines of McMurray, Dillon, and Newman, as well as Chase Elliott, who changed tires on the #9 NAPA Auto Parts Chevrolet, and Daniel Suarez in a backup #19 ARRIS Toyota. Before these cars could shuffle positions on the pace laps, all of them had to drive around the #41 Monster Energy / Haas Automation Ford of Kurt Busch. Busch had radio trouble, forcing the crew to swap out both his helmet and the steering wheel. The swap took nearly two full pace laps. Busch returned to the track and resumed his spot alongside polesitter and teammate Kevin Harvick. As the field took the one to go signal at the start/finish line, Ty Dillon was the first to fall to the rear, followed by McMurray, Newman, and Suarez. Down the backstretch, Ross Chastain voluntarily surrendered his 35th starting spot in the #15 Chevrolet. When the race started, Chastain was lined up with the #51 Keen’s Buildings / Race to Erase Opioids Chevrolet of Timmy Hill. The field stacked up near the back, forcing Hill to pull out of line on the inside. 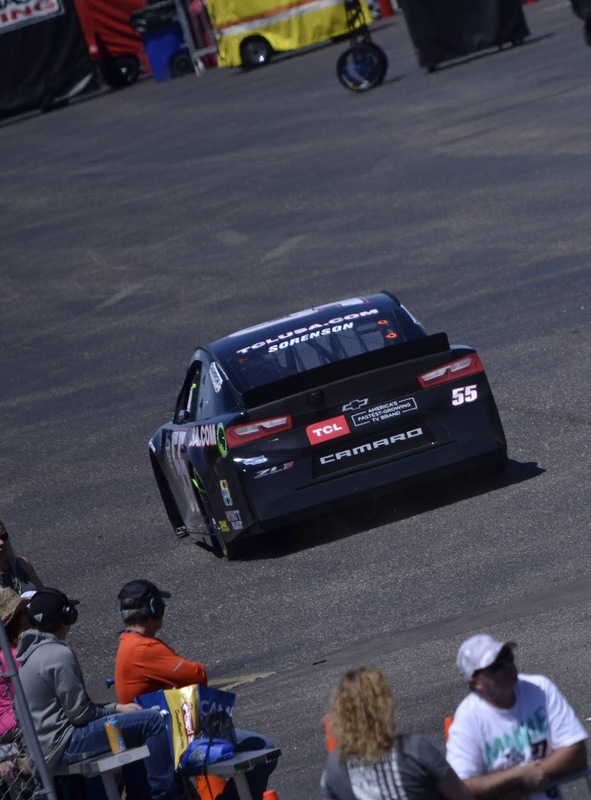 This caused Hill to lose touch with the pack in Turn 1, even when he linked up with Chastain’s teammate Reed Sorenson in the #55 TCL Television Chevrolet. By the end of Lap 2, Hill and Sorenson were both losing touch with the pack, and Chastain fell behind in 38th by Lap 6. Three circuits later, every driver in the Bottom Ten, leading up to 31st-place Ryan Newman, had broken up into groups of one or two cars apiece, all of them losing ground to the leader’s single-file pack. Hill remained in last during the opening green-flag run, and was already in danger of losing a lap on the 12th circuit. 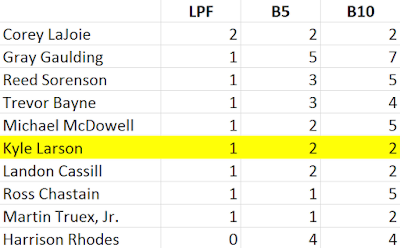 That time by, many of the leaders came down for their first round of stops, allowing Alex Bowman to inherit the lead. Bowman caught and passed Hill and Sorenson entering the tri-oval on Lap 13, pulling to the inside to lap them. Two laps later, the pair moved ahead of Clint Bowyer, who took 40th on Lap 15. Bowyer’s #14 Haas Automation Demo Day Ford was forced to make a second stop when, according to FOX, Bowyer flat-spotted the right-rear tire coming down pit road. Bowyer returned to action two laps down and, by Lap 19, found a spot in line between Austin Dillon and Chris Buescher, both near the back of the main pack. Sorenson's #55 goes behind the wall. On Lap 54, Sorenson re-appeared on RaceView as he returned to the track 36 laps down. But by the end of Stage 1 on Lap 56, he was back on the apron, saying the car wouldn’t turn. On that lap, Sorenson returned to the garage a second time, his car once again disappearing off RaceView. There, Sorenson continued to lose laps as the race continued without an accident for 71 laps. Larson towed behind the wall after time expired. Larson didn’t enter the last-place picture until Lap 72, when his teammate once again found trouble. This time, Jamie McMurray was running on the outside of Erik Jones’ #20 XYO Network Toyota when Jones lost control, sliding into McMurray, who clipped the #6 AdvoCare Ford of Trevor Bayne to his outside. The contact sent Bayne into the wall and McMurray to the inside, where he sideswiped a passing Larson. Larson spun down the track and slammed the inside wall with the right-rear of his car. Under the caution, Larson managed to drive his battered machine back to pit road, where he was put on the six-minute “Crash Clock.” Larson took 39th, but was briefly passed for the spot on Lap 75 was Bayne’s #6 was loaded on a flatbed and brought to the garage. 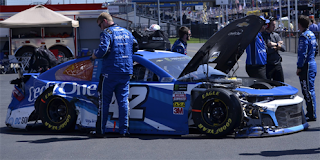 When Larson’s six minutes ran out and the #42 went behind the wall, however, Larson re-assumed 39th place from Bayne, now 37th, with Jones ranked 38th. On Lap 74, during this same caution, Sorenson brought the #55 back on the track a second time, now 54 laps down to the leaders. He trailed the field when the race restarted on Lap 79 and continued to run by himself for the rest of the race. If all things stayed the same, and Sorenson ran the race to completion, he would pass Larson, Jones, and Bayne for position in 48 laps. As the race wore on, Sorenson tried his best to stay out of trouble. On Lap 92, he pulled low on the backstretch as the leaders sped by, putting him another lap down. On Lap 103, he tried to latch on to a three-car pack trailed by Timothy Peters, making his Cup debut in the #92 Advance Auto Parts / NTS Tire & Wheel Ford. Unfortunately, Sorenson couldn’t keep up, and the pack disappeared around the next corner. Sorenson was still rolling on Lap 110, the end of Stage 2. At the time, he was 56 laps down to the leader, but now just 18 circuits from climbing past the three wrecked machines. Finally, on Lap 128, Sorenson passed Larson, Jones, and Bayne, securing Larson the last-place finish. Sorenson continued on for another seven laps before he pulled behind the wall for a third and final time, securing 37th. At the time, no other driver was more than 13 laps behind the leader (the damaged #1 of Jamie McMurray). 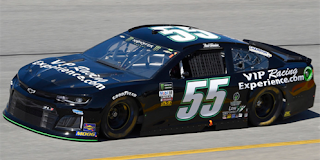 It was a redemption of sorts for Premium Motorsports, one week after a similar effort by Sorenson’s team got the #55 back out at Richmond after early trouble, but still remained in last place. Rounding out the Bottom Five was Hill, whose #51 blew an engine on Lap 156. *This marked the first last-place finish for car #42 in a Cup Series race at Talladega since May 7, 1972, when singer-songwriter turned racer Marty Robbins’ run in the #42 1972 Dodge was disqualified for allowing his restrictor plate to come loose during the race. 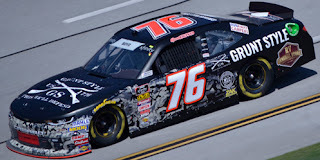 Spencer Boyd picked up the 1st last-place finish of his NASCAR XFINITY Series career in Saturday’s Sparks Energy 300 at the Talladega Superspeedway when his #76 Grunt Style Chevrolet was involved in a multi-car accident after 32 of 115 laps. The finish came in Boyd’s 17th series start. In the NASCAR XFINITY Series last-place rankings, it’s the 2nd for car #76, the 316th by reason of a crash, and the 501st for Chevrolet. Across NASCAR’s top three series, it’s the 10th for the #76, the 1,136th by reason of a crash, and the 1,590th for Chevrolet. Born in Creve Coeur, Missouri, the 23-year-old Boyd made his NASCAR debut in the Truck Series at Martinsville, a popular venue for drivers breaking into the series’ top three divisions. Boyd was the latest to drive for veteran Truck Series owner Mike Mittler, and drove a #63 Go-Parts.com RAM to a 28th-place finish after a late-race crash. For the rest of the 2016 season, Boyd would make four more NASCAR starts for four different owners in two different series. His next race was the Truck Series event at Gateway on June 25, where he finished 19th – on the lead lap – for Premium Motorsports. The next month at Iowa on July 30, he made his XFINITY Series debut for Rick Ware Racing, finishing 29th, the last car under power. Another XFINITY start for the struggling Obiaka Racing came at Chicago on September 17, but he was flagged off the track for running too slow, leaving him 35th. He rounded out the year in Trucks, finishing 30th for Mark Beaver. The Homestead race was Boyd’s first with sponsorship from GruntStyle.com, an Illinois-based apparel company operated by – and raising funds for – military veterans. The brand helped Boyd expand his XFINITY and Truck Series efforts in 2017. On the Truck side, he again split his time among different owners, driving for Ware, Beaver, and D.J. Copp, who gave him a season-best 13th at Talladega. On the XFINITY side, he slid into the seat of SS-Green Light Racing’s #07, splitting the ride with Ray Black, Jr. In six starts for the Bobby Dotter-owner team, Boyd finished a season-best 28th at Chicagoland. This year, Boyd and SS-Green Light have expanded their efforts into a full-time campaign. The car number has been changed from #07 to #76, a reference to GruntStyle’s patriotic apparel (a small “17” is printed on the car’s “7” decal to indicate “1776”). The brand has gone all-in backing Boyd’s efforts this year, bringing a souvenir trailer of his own to races, and signing as a sponsor at the Motor Racing Network (MRN). Coming into Talladega, Boyd had just one DNF – a suspension issue early on at Las Vegas – and finished a season-best 25th three times with no runs (other than Vegas) of worse than 30th, placing him 29th in series standings. At Talladega, Boyd ran 27th in Friday’s opening practice and was not among the 17 drivers who participated in Happy Hour. He then earned the 30th spot in qualifying with a lap of 183.466mph (52.195 seconds). With no Cup regulars in the field for a third-straight XFINITY Series race, the Dotter team hoped to turn heads after Ray Black, Jr. trailed the Talladega race last year. Starting last on Saturday was Mike Harmon, whose #74 Horizon Transport Dodge edged out the #89 Visone RV Chevrvolet of fellow owner-driver Morgan Shepherd. Shepherd missed locking himself in the field on speed by 0.204 second to Kaz Grala, and was out-ranked by Mike Harmon on Owner Points. Thus, Harmon, who despite having turned the slowest lap of the session at 179.021mph (53.491 seconds) earned the final spot in the field. Shepherd was sent home along with the withdrawn #54 NXT Motorsports entry, which didn’t list a driver. In the race, Harmon was joined at the rear by outside-polesitter Elliott Sadler, who changed engines on his #1 OneMain Financial Chevrolet, and both the #35 Sparks Energy Chevrolet of Joey Gase and the #45 Prevagen Toyota of Josh Bilicki for unapproved adjustments. Heading into the first corner, Sadler, Gase, and Bilicki began to climb through the field, leaving a line of black cars trailing single-file on the inside line. Among these cars were the three RSS Racing teammates of Ryan Sieg (#39), J.J. Yeley (#38), and Jeff Green (#93). Sieg’s red-and-black car, sponsored by Alabama Soda & Abraisive Repairs, took last at the end of the first lap. By the end of Lap 2, the 40th spot fell to Jennifer Jo Cobb, who was making her first XFINITY Series start at Talladega since 2011. This time around, she drove in place of Stephen Leicht in JP Motorsports’ #55 Swamp Daddy Crawfish / Show Me Dega Coulevard Club Toyota. In the early laps, the radio traffic crackled of an on-track dispute with Harmon as the pair battled for the 39th spot behind the RSS Racing trio. As this unfolded, Cobb and Harmon lost touch with the rest of the field, losing 18 seconds to the leaders. Next to fall to last was Jeremy Clements, who on Lap 9 dropped back with reports of a fuel pressure issue. Clements caught and re-passed Cobb and Harmon, only to lose touch a second time by Lap 12, when the leaders passed him in a single-file train off Turn 4. Four circuits later on Lap 16, the RSS Racing trio was broken up when J.J. Yeley’s #38 Josh Roberts Trucking and Repairs Chevrolet had a tire going down. 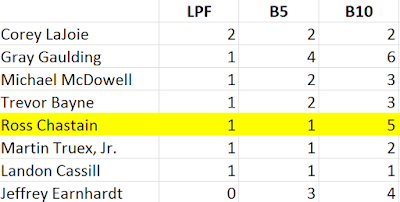 Yeley lost a lap, then took last from Clements on Lap 19. Yeley caught and passed Clements by the 27th circuit, and Cobb fell behind Clements on the Lap 32 restart following the end of Stage 1. On Lap 33, Cobb was still running in the back when trouble broke out in the middle of the field. Coming off Turn 2, Shane Lee’s #3 Childress Vineyards Chevrolet got a run on Dylan Lupton in the #28 thinQ Technology Partners Ford. 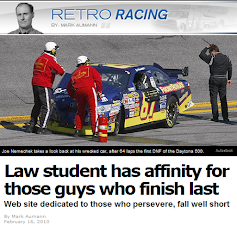 The run caused Lupton to lose control, clipping the rear of a passing Ty Majeski in the #60 Ford-sponsored Ford. As this was happening, Spencer Boyd closed in on the scene at such a high rate of speed that it seemed he had no brakes. He first struck a spinning Chad Finchum, ramping over the nose of his #40 Smithbilt Homes Toyota, then did the same to Lupton’s #28, lifting the right-front of Boyd’s car into the air. Boyd landed on all four wheels, ultimately crashing to a stop into the wrecked machines of Majeski and Ryan Truex, the latter in the #11 Bar Harbor / Sea Watch International Chevrolet. 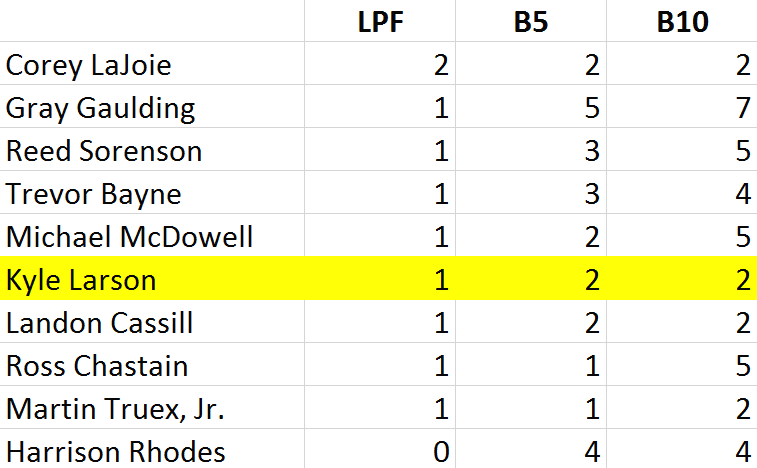 Under the caution, the five cars eliminated in the accident – Boyd, Finchum, Truex, Majeski, and Lupton – promptly took last from Cobb. Boyd, last on the scene, took 40th in the final running order. The race marked the first XFINITY Series victory for Spencer Gallagher, who has not finished last in 49 career XFINITY starts. *This marked just the second last-place finish for car #76 in an XFINITY Series race. 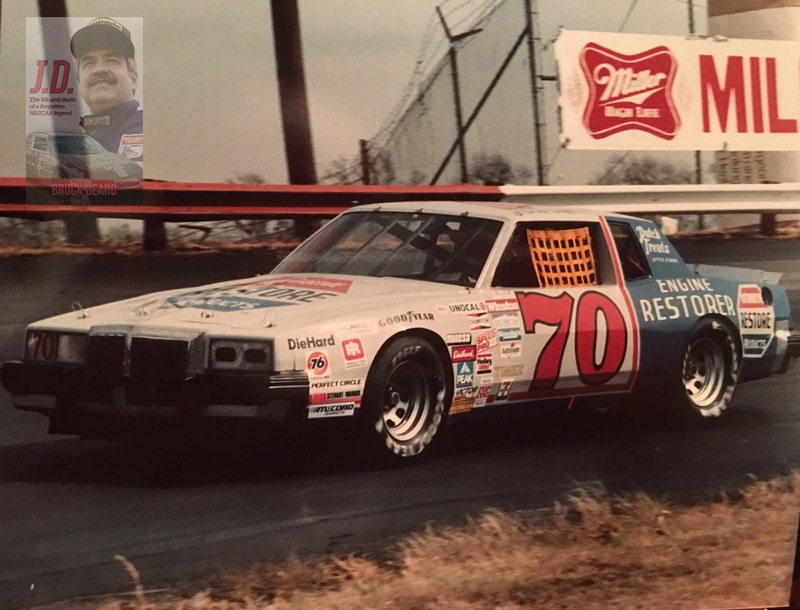 The only other time occurred May 14, 1983, when Butch Lindley’s #76 Dana Racing Pontiac started 3rd but lost an engine after 28 laps of the Sportsman 200. *This marked SS-Green Light Racing’s second-consecutive last-place run in this event. Yesterday at Talladega, Hylton Motorsports didn’t complete a lap of ARCA’s General Tire 200. The #48 Ford had a new front valence, but according to driver Brad Smith, struggled with mechanical issues all weekend. Smith made a pit stop before the start, then ultimately turned behind the wall, leaving him last in the 31-car field. As the race wore on, the crew loaded up the team’s small white trailer. Crew chief Terry Strange climbed aboard the truck that would pull it back home. Joining him were the team’s owner, James Harvey Hylton, and his son James “Tweet” Hylton. Today came the news. Overnight, the truck crashed on a highway in Georgia. Hylton and his son were killed. It’s tragically ironic that the accident occurred after a race at Talladega. The superspeedway saw one of Hylton’s proudest moments as a driver. On August 6, 1972, he flew to victory in his self-prepared #48 Pop-Kola Mercury, leading 106 of 188 laps. It was his second of two Cup Series victories, the other coming at the Richmond Fairgrounds Raceway just over two years earlier. As long ago as those races may seem, in truth, he was close to victory even earlier. He made his first Cup start on July 8, 1964, running at the Old Dominion Speedway, a 0.375-mile paved track in Manassas, Virginia. He drove a backup car belonging to Ned Jarrett, the Bondy Long-prepared machine changed from #11 to #71 with a couple streaks of paint. Hylton was eager to prove himself, and showed speed early, but was under strict instructions to park the car. To ensure this, the team had welded shut the gas cap. Two years later in 1966, he returned to action with a car of his own. Hylton founded his own team, Hylton Motorsports, in his hometown of Inman, South Carolina. He chose car #48, and with sponsorship from Econo Wash, made the long trip west to Riverside, California. Transmission trouble stopped his Dodge, but he still finished 21st. What followed was one of the most incredible rookie seasons in NASCAR history. Weeks later, in his first Daytona 500, Hylton finished 9th. He came home 5th at Bristol. At season’s end, after 41 starts, he’d finished Top Five in nearly half of them – 20 – and earned a Top Ten in all but nine. To top it off, he finished 2nd in the series standings, trailing only David Pearson, who had the advantage of starting one more race. In an age where Pearson and Richard Petty dominated, it’s been overlooked just how strong Hylton was back then. He was the Matt Kenseth of his day, showing tremendous consistency. From 1966 through 1973, he never ranked worse than 7th in points, including two more runner-up finishes to Richard Petty in 1967 and 1971. When NASCAR reduced the length of the Cup schedule and set minimum race lengths, Hylton made the adjustment with surprising smoothness. He was 3rd in the standings in 1975 and 7th in 1977. It was only at the turn of the following decade that Hylton scaled back on his Cup effort, bringing in other drivers to run his #48: Ronnie Thomas, Tony Spanos, and most notably Canadian driver Trevor Boys. Hylton still raced from time to time, becoming an ageless owner-driver like his contemporaries, Dave Marcis, J.D. McDuffie, and the like. In this role, he led a group of independents who successfully petitioned NASCAR for a fair pay structure. The “Plan A” and “Plan B” system, basically a “best-in-class” program for owner-drivers, soon became a part of NASCAR’s contingency sponsor program. Hylton was also resourceful with the assets he had on hand. In 1991, when he was 56, Hylton qualified a Buick that was so old, NASCAR thought it was a Chevrolet. “Hyltonmobile” became the “official” term. 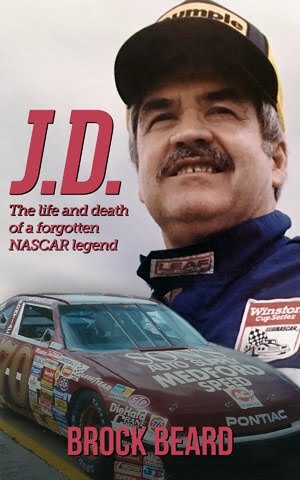 After the passing of J.D. McDuffie, Hylton welcomed several members of McDuffie Racing to join his effort in 1992. 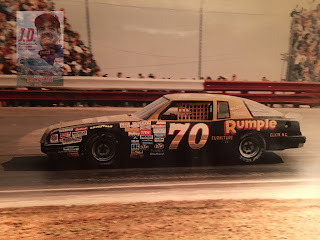 That season, Hylton made more starts in the Cup Series than any season since 1982, thanks to the backing of McDuffie supporters Rumple Furniture, Classic Trophies, and the Stettmeier family. By the 1990s, Hylton had found a home in the ARCA Racing Series, where he continued to break age records. His first full-season attempt came in 2006, when he was 71. His best finish of the year was a 21st at Pocono, the same track where he ran the “Hyltonmobile” 15 years earlier. Over the following offseason, Hylton acquired another old Chevrolet – this time a bright orange Cup car from Richard Childress Racing that had once been Jeff Burton’s Cingular Wireless machine. With it, Hylton put together an effort to make his first Cup Series start since 1993, and his first Daytona 500 since 1983. With Jimmie Johnson now campaigning the #48, Hylton’s Retirement Living TV car carried #58. In the final laps of his 150-mile qualifier, Hylton had raced his way into a transfer spot before a late caution, then a broken transmission, left him out of the field. Another Daytona 500 attempt followed in 2009, but this time the car withdrew after missing practice. Hylton’s driving career continued for another four years, during which time he continued to dabble in the Xfinity and Truck Series. His final start as a driver came on October 4, 2013, when he closed out the ARCA season 11th in points following an 18th-place showing at Kansas. At the time, his age was 78 years, 1 month, and 8 days. While Hylton Motorsports has remained a fixture in the ARCA Racing Series since 2013, the team now faces an uncertain future without its founder. Another piece of NASCAR’s owner-driver past has been lost. Some may call it a casualty of a changing sport, but to do so would risk forgetting all that this man and this team has done for two different stock car series – two series which, also yesterday, announced another big step in their history. Most of all, as Hylton lived, and as Hershel McGriff prepares to run a K&N Pro Series West event next week at age 90, there is perhaps hope that others will seek and find such longevity in stock car racing. There are 41 drivers entered to attempt Saturday’s 40-car field, meaning that one driver will miss the race. Jeb Burton finished a solid 12th in his season debut at Richmond. This week, he climbs out of the #3 as Shane Lee returns for the first time since his series debut at Bristol, where he ran 14th. Lee has two ARCA starts at Talladega with finishes of 11th in 2016 and 5th last year. On Tuesday, Tommy Joe Martins revealed that the McLeod team will be running Toyotas instead of Chevrolets this Saturday at Talladega, and at Daytona in July. For Martins, Saturday will be his first XFINITY Series start at Talladega since 2014, when he drove his family-owned #76 Diamond Gusset Jeans / Land No Tax Dodge to a 14th-place finish, still his second-best run in the series. McLeod himself will run as his teammate in the #78 Toyota. Sponsorship has yet to be announced for either car. Following a 24th-place finish by Tony Mrakovich in his XFINITY Series debut at Richmond, Dylan Lupton returns to the controls of JGL Racing’s #28 Ford. It will be Lupton’s first Talladega start, and comes on the heels of his restrictor-plate debut at Daytona in February, where he ran 27th. All three of RSS Racing’s Chevrolets will make full-race runs this Saturday as all three have sponsorship for the race. J.J. Yeley will remain in the #38 (yellow roof and door numbers) with Josh Roberts Trucking and Repairs on the hood. Jeff Green will run the #93 (green roof numbers, white door numbers) with C2 Freight Resources on the hood and quarter-panels. Ryan Sieg runs the #39 (red roof numbers, white door numbers) with Alabama Soda & Abrasive Blasting, along with associate backing from J. Pigg Construction. All three drivers will be ones to watch following the team’s strong overall performance at Daytona and Green’s 18 laps led in this race last year (when he drove for B.J. McLeod). The preliminary entry list included 42 drivers until the #54 Toyota team withdrew without a driver or crew chief listed. The team had run the most recent plate race at Daytona, finishing 38th with Gray Gaulding after a rear gear failure. On Monday, it was announced that Truck Series driver Jennifer Jo Cobb, back from her NASCAR Euro Series debut in Valencia, driving in place of Stephen Leicht in the #55 Toyota. According to the announcement on Catchfence.com, Cobb brings with her sponsorship from the Swamp Daddy Crawfish restaurant and the Show Me Dega Boulevard Club. It will be Cobb’s first XFINITY Series start since last fall at Kansas, and her first in the series at Talladega since she ran 37th for Rick Ware in 2011. Josh Bilicki will remain in the second JP Motorsports entry, the #45 Prevagen Toyota. Ty Majeski has never before started a race on a superspeedway, both in the XFINITY Series and in ARCA. This Saturday, he will make his second start of the season, taking the place of Chase Briscoe in the Ford-sponsored #60. Briscoe makes the move to the #98 this weekend. Majeski made his 2018 season debut in the #60 two weeks ago at Bristol, where a crash left him 34th. Josh Williams returns to Mario Gosselin’s #90 team after a one-week hiatus for Brandon Brown’s 19th-place performance last week in Richmond. It will be Williams’ first XFINITY Series start at Talladega, but not his first on a restrictor-plate track. He ran the last two series races at Daytona, finishing last in July 2017 and 22nd this past February. He also has five ARCA starts at Talladega with his best finish being his most recent, a runner-up to Gus Dean in 2016. The DGM team has elected not to bring out their second car (#92), as they have in several plates races before. The #98 team makes its return to the XFINITY Series for the first time since Bristol, two weeks ago. Behind the wheel is the same driver who ran that day, Chase Briscoe, who slides over from Roush-Fenway Racing’s #60 to make way for Ty Majeski. Like Majeski, the #98 does not have a listed sponsor other than Ford itself. The XFINITY Series is without Cup regulars for the third-consecutive race. While the last two rounds were because of “Dash 4 Cash” events, this week will feature Cup drivers in FOX’s second-ever “Driver’s Only” broadcast. There are 40 drivers entered for 40 spots, meaning that all entrants will start the race. It’s just the second full field of the 2018 season, and the first since the previous plate race in this year’s Daytona 500. On Wednesday, it was announced that Matt Kenseth would be returning to active Cup Series competition in 2018, and would be bringing additional sponsorship from Wyndham Rewards to the #6 team. Trevor Bayne, who has driven the car since 2015, will share the ride with Kenseth starting at Kansas in two weeks. In the meantime, Bayne is entered both this weekend and next week in Dover. Daniel Hemric kept his nose clean in his Cup debut last Saturday in Richmond, finishing 32nd, three laps down to race winner Kyle Busch. While Hemric will have to wait until the September 30 debut of Charlotte’s “roval” for his second Cup start, the driver will continue his regular-season effort in the XFINITY Series, including this Saturday’s 300-miler. For the second-straight race, SunFrog.com was on the preliminary entry list as the primary sponsor for Gray Gaulding's Toyota. For the second-straight time, that is not the case - this time, Earthwater is on the car. 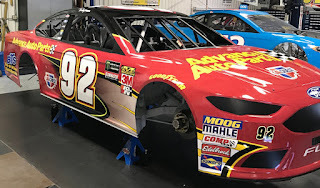 Matt DiBenedetto announced at Talladega that Zynga Poker, which joined the #32 for its fan-funded effort at Phoenix, will return for seven races, plus the All-Star Race in May. Can-Am and Wholey remain the backers at Talladega. Darrell Wallace, Jr.’s Medallion Bank Chevrolet will once again carry the traditional bright red and Petty blue colors this weekend, along with the Petty’s Garage logo on the hood. “The King” steered these colors to two Talladega wins – one each in 1974 and 1983 – and finished 15th in his final two starts there in 1992. The preliminary entry list showed XFINITY Series regular Cole Custer returning to action for the first time since his Cup debut at Las Vegas. Former FOX News reporter Scott Bolling tweeted on Wednesday that Kevin O'Connell would drive, making his first Cup start since Sonoma last year. But the drover will be Timmy Hill, who goes double-duty with XFINITY. Sponsoring the car is both Keen's Buildings, which sigbed over the offseason, and RaceToEraseOpioids.com. The latter is an initiative to stop opioid abuse, following a similar effort by J.J. Yeley at Martinsville. Bolling endorsed the run as partner. Hill makes his first Cul start since Fontana and takes the place of Harrison Rhodes, who ran 36th last week in Richmond. Reed Sorenson’s #55 makes the manufacturer switch from Chevrolet to Toyota this week with sponsorship still to be determined. Teammate Ross Chastain in the Chartered #15 is still listed in a Chevrolet. UPDATE: Sorenson's car is a Chevrolet and has new sponsorship from TCL Television. The last time we saw this team, Brendan Gaughan was in position to threaten for a win late in the Daytona 500. Following a crash and several repairs, the #62 team is back with the same sponsorship from Beard Oil and South Point Hotel & Casino. Gaughan’s best Cup Series finish to date came at this track in 2004, when he led seven laps and finished 4th for Doug Bawel. Driver and team finished 26th and 19th at the track last year. Following Mark Thompson’s return in the Daytona 500 and Chad Finchum’s debut in Bristol, Carl Long has not fielded a Cup car this weekend. The team will still be trackside, however, as Finchum and Timmy Hill will run as teammates in Saturday’s XFINITY Series race. The unsponsored black-and-white Chevrolet for Cole Whitt appeared in Tallladega with a hood decal for "1950 Clothing Company." Ricky Benton’s Truck Series team returns for their own first Cup effort since David Gilliland brought their former Richard Petty Motorsports Ford home in 14th place. With Gilliland pondering retirement, the wheel has been handed to Timothy Peters, who has been struggling to find rides since the closure of Red Horse Racing. Peters aims to make his Cup debut on Sunday with sponsorship from Advance Auto Parts and a Roush-Yates engine under the hood. D.J. Kennington and the Gaunt Brothers team return to action at Talladega, where they missed the cut in qualifying last year. With exactly 40 cars on the list, Kennington is set to make his Talladega debut, though as in their most recent start at Bristol, have not announced a sponsor. Welcome back Joey Gase, who aims to make his first Cup start since Las Vegas, where he turned in a 32nd-place performance for Premium Motorsports’ #55. This time around, Gase takes the place of Landon Cassill in Derrike Cope’s #00. Cassill, who finished 4th at Talladega in the fall of 2014, is not entered in Sunday’s race. Gase brings with him sponsorship from Sparks Energy, which not only backs Gase’s XFINITY Series #35 Chevrolet from Go FAS Racing, but will also sponsor Saturday’s XFINITY race. Gase drove both Cup races at Talladega last year, finishing 21st for Premium Motorsports in the spring and 32nd for BK Racing in the fall. Next weekend’s tripleheader at the “Monster Mile” will begin with the fifth round of the Truck Series. Only once in the history of the Talladega Superspeedway did the driver classified last fail to start the race. 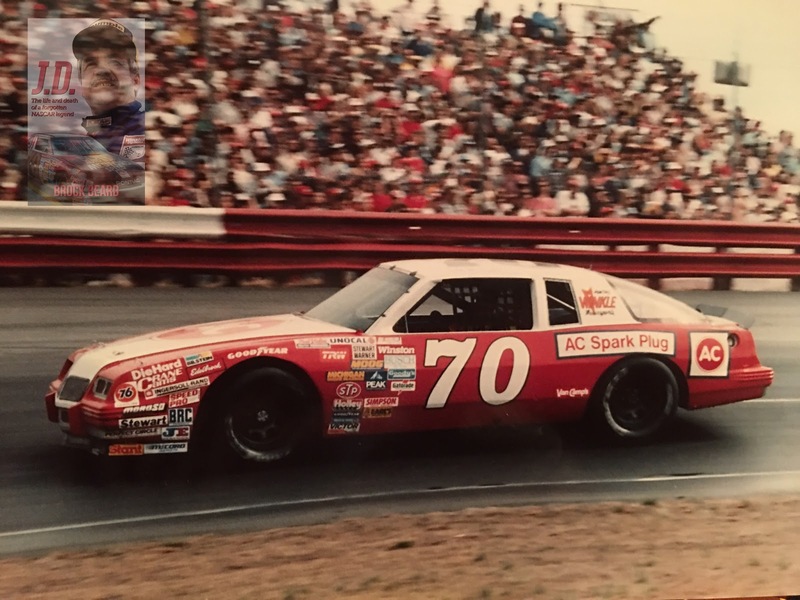 On May 6, 1979, during the running of the Winston 500, Triangle, Virginia native Travis Tiller had secured a spot in the field, edging out six other drivers, including eleven-time XFINITY Series race winner Chuck Bown. For reasons not listed, Tiller didn’t start his #46 Ring Enterprises Dodge, and was classified last. The DNS prevented him from being involved in a terrible Lap 5 accident that broke out near the lead between Buddy Baker and Cale Yarborough. The other two Dodge Magnums entered in the race, belonging to owner-drivers Buddy Arrington and Frank Warren, finished a strong 3rd and 8th, respectively. For Arrington, it was the best finish of his winless 560-race Cup career. He led Laps 15 and 16, then finished one spot in front of Richard Petty, from whom he’d purchased his #67 Reid Trailer Sales Dodge. For Warren in the #79 Native Tan Dodge, it was the 29th and final top-ten finish of his 396-race career. Bobby Allison won the race in the late Bud Moore’s Ford. The Talladega Superspeedway has had a long history of surprise winners and strong performances by unheralded drivers and teams. For McDuffie Racing, it was a gamble – each start a test of the durability of his hand-crafted engines, and at worst, the risk of totaling one of his few remaining cars. McDuffie made 28 starts at Talladega and failed to finish 15 of them – more than half his starts there. An oil leak was the listed cause of a Lap 73 retirement on August 23, 1970, the third race ever run at the superspeedway. In a race won by Pete Hamilton, McDuffie drove a 1969 Mercury up to the 29th spot on the grid, and despite the DNF finished ahead of inaugural Talladega winner Richard Brickhouse, who placed 48th in a sprawling field of 50. McDuffie never broke the Top 20 at Talladega until May 6, 1973, when he was one of the beneficiaries of a massive pileup on Lap 9 that eliminated 19 of the 60 starters, including polesitter Buddy Baker, and critically injured Hall of Famer Wendell Scott. Even then, McDuffie still failed to finish, this time with a busted oil pan after 147 laps. The attrition was enough to leave him 18th at the finish. None of McDuffie’s 32 last-place finishes occurred at Talladega, but two of his Top Tens did. The first occurred on August 8, 1976, the day Dave Marcis won by nearly a lap over Buddy Baker. It was the first Talladega race in two years where the #70 finished under power. McDuffie finished 7th that day, working his way up from 31st on the grid, and came home six laps behind the leaders. On the same lap were Lennie Pond and Tighe Scott. The second occurred in the same event a year later on August 7, 1977. This time, he ran 8th, five laps behind winner Donnie Allison, and just one spot behind Bobby Allison’s AMC Matador. The two times McDuffie came closest to finishing last were a pair of next-to-last-place runs on May 14, 1978 and May 4, 1980, both due to engine failure. In the first, he was edged by a lap by Coo Coo Marlin, Sterling’s father, while the second was by 15 laps to a frustrated Darrell Waltrip, who busted a cam on his DiGard-prepared #88 Gatorade Oldsmobile. Fortunately for McDuffie and his small budget, he only crashed out of one Talladega race. Tragically, that same wreck on August 17, 1975 claimed the life of veteran Tiny Lund after his Dodge was struck by the Pontiac of Terry Link. In his seven Talladega starts from the 1980 finish onward, McDuffie never finished worse than 28th and only failed to finish one more time, a burned piston in the late stages of Cale Yarborough’s win on July 28, 1985. However, in the crescendo toward the institution of carburetor restrictor-plates in 1988, McDuffie began to have trouble qualifying. From 1981 through 1987, he missed half of his 14 attempts, including both races in 1984 and 1986. His final start at the track came on July 26, 1987, two months after Davey Allison’s first career win. 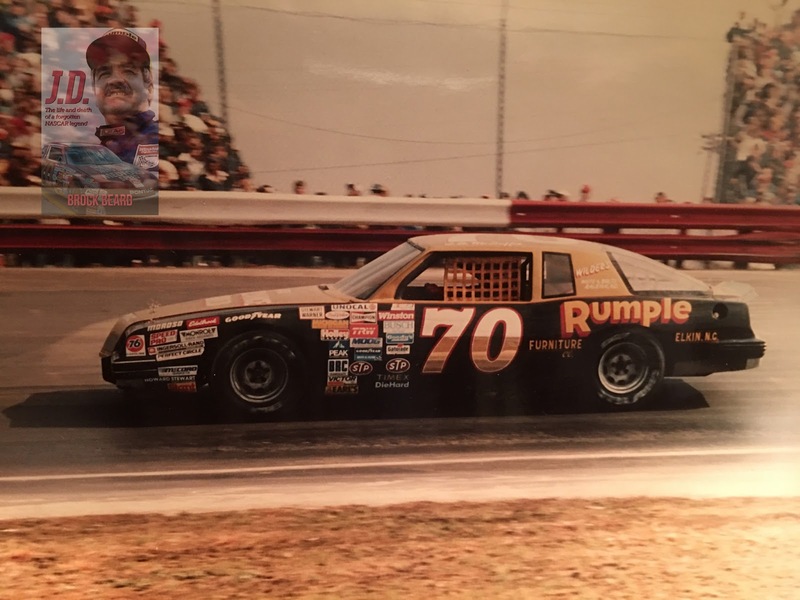 The #70 Rumple Furniture Pontiac started 35th in the field of 40 and finished 25th, the third-to-last car to cross the line under power. McDuffie’s final attempt to make the Talladega field was in May 1991, when he brought to the track the same dark blue Pontiac that just missed the cut for the Daytona 500. 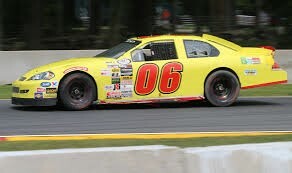 McDuffie was the second-fastest car to miss the race, following Mark Gibson, and was then invited to compete in the weekend’s ARCA Racing Series event. McDuffie Racing elected not to enter the July 28, 1991 running of the DieHard 500, and instead turned their attention to Watkins Glen, just two weeks later. 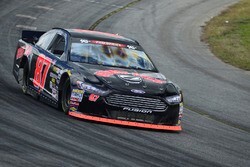 Mark Meunier finished last for the third time in his ARCA Racing Series career in Sunday’s Kentuckiana Ford Dealers 200 at Salem Raceway when his #0 Peterson Motorsports Ford did not start. The finish came in his 36th series start and was the first since Kansas in 2017, four races ago. Meunier is a native Kentuckian from the Louisville area. 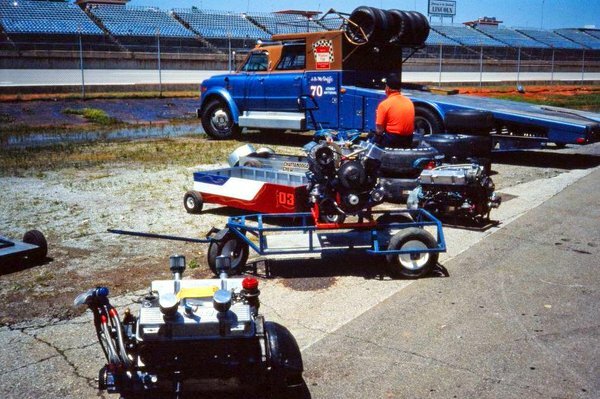 Before transitioning to ARCA, he raced Street Stocks at Louisville Motor Speedway, which hosted Truck races until 1999, and has raced late models at Kentucky Motor Speedway, a 3/8-mile track not far from Owensboro. He made his ARCA debut at this very race five years ago for Carter 2 Motorsports, finishing 23rd in a 28-car field after a mid-race crash. In the 34 starts between then and now, he competed for Carter, Kimmel Racing, Dale Shearer Racing and Wayne Peterson Racing, who he first teamed up with in late 2016. Meunier finished nine of those starts with a best finish of 16th at Elko in 2013, in his second start. This race marked his first appearance of the year for Wayne Peterson Racing. According to his Twitter account, at one point he tried to compete in the April 2016 XFINITY race at Bristol, but a team was never made and the effort did not come to fruition. He also works as a driving instructor for the Richard Petty Driving Experience. The entry list for Sunday’s race topped out at 27 cars, which shrunk to 25 following the withdrawals of Hixson Motorsports’ two cars, which was due to the rising costs of the series. Among the drivers entered were four debuts: JR Motorsports late model driver Josh Berry, who teamed up with Chad Bryant Racing, who bought the assets of Cunningham Racing, in the team’s #22; Colby Howard, a sixteen-year-old Late Model Stock driver who originally drove motorcross, entered in Mason Mitchell Motorsports’ only entry; 2017 ARCA/CRA All-Star Tour champion Jack Dossey III, entered with his family team; and Matt Dooley, a Limited Late Model driver who competes at dirt tracks around Georgia, who was entered in Fast Track Racing’s #11 car, this week a Ford. 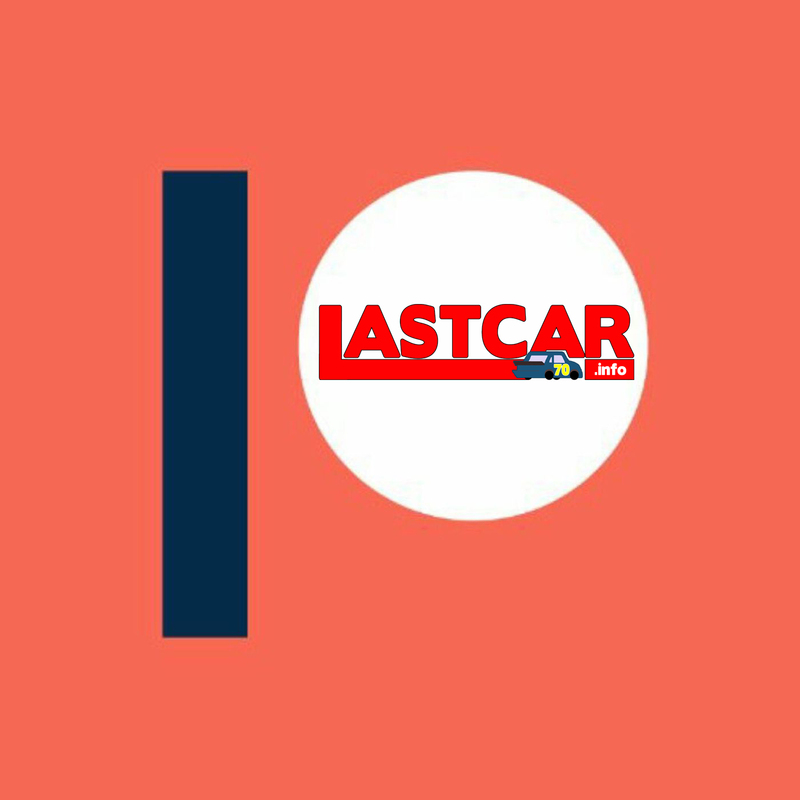 Of the four, only Dossey has announced more races, as per ARCARacing.com and The Pit Lane he will return with an old Cunningham Motorsports car at Lucas Oil and the second Salem race of the season. Meunier finished last in Friday’s lone practice session. His fastest lap was a 21.4, a tenth slower than his WPR teammate Con Nicolopoulos and 4.3 seconds off of leader Chandler Smith’s time. In qualifying, the field was shortened one more, as James Hylton Motorsports’ #48 car, driven by Brad Smith, suffered an engine failure in practice and was forced to skip the rest of the weekend. Again, the bottom of the charts were led by Meunier, who picked it up to a 20.576, four and a half tenths off of Dale Shearer, making his first start of the year. Meunier’s car never registered as being on-track, according to ARCA’s timing and scoring. Racing-reference.info later indicated that his car pulled off the track on the first lap. That left him 24th and last. 23rd went to Dooley, who went to the garage with two laps complete, came back around lap 50 and returned to the garage soon after, done for the day. Next to fall out was Fast Track Racing’s other driver, Richard Doheny. Similar to Dossey, Doheny went to the garage after four laps and came back around lap 50, only to retire after causing the race’s second caution. Both Dossey and Doheny were listed out with crash damage. Nicolopoulos completed 9 laps, went to the garage, completed 11 more and then returned for the day, edging out Doheny for 21st by a lap. Rounding out the Bottom Five was Shearer, whose car made a hard impact with the wall to bring out the day’s first caution. Looking ahead, only 24 entries are filed for next Friday’s General Tire 200 at Talladega. Jesse Iwuji and Wayne Peterson Racing have announced entries but have not filed. 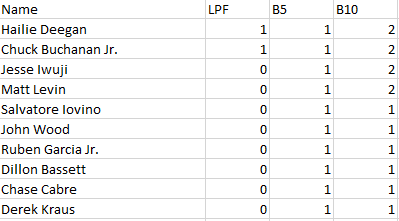 If only 26 cars show up, it will be the shortest restrictor plate field in an ARCA race since Racing-Reference started keeping ARCA stats. The current low is 35, at Talladega a few times in the early 2010s. Reed Sorenson picked up the 16th last-place finish of his Monster Energy NASCAR Cup Series career in Saturday’s Toyota Owners 400 at the Richmond Raceway when his #55 VIPRacingExperience.com Chevrolet fell out with electrical problems after 188 of 402 laps. The finish, which came in Sorenson’s 294th series start, was his first of the season and first in a Cup Series race since May 7, 2017, just under one year ago, at Talladega. In the NASCAR Cup Series last-place rankings, it’s the 47th for car #55 (breaking a tie with the #19 for the second-most in series history), the 742nd for Chevrolet, and the 36th by reason of electrical trouble. Across the top three series, it’s the 60th for the #55, the 1,589th for Chevrolet, and the 114th for electrical trouble. 2018 marks Sorenson’s 14th season on the Cup Series tour. A member of the stacked 2006 Rookie of the Year class, the Georgia native has driven for the likes of Chip Ganassi and Richard Petty, served as a relief driver for Brian Vickers at Team Red Bull, and has driven for no less than eleven underfunded and single-car Cup operations. In the last eight seasons, Sorenson has finished no better than 14th and run just one full season, when he closed out Tommy Baldwin Racing’s #36 team in 2014. Midway through 2015, Sorenson landed at Premium Motorsports, which longtime XFINITY Series car owner Jay Robinson had formed out of several shuttered teams, including LASTCAR contenders Identity Ventures Racing (former NEMCO Motorsports) and Phil Parsons Racing. When the Race Team Alliance’s new Charter system was instituted in 2016, Sorenson’s Premium-prepared #55 was entered as an “Open” team, filling the one remaining available spot after a series of short 39-car entry lists. This year, as the fields grew shorter still, Premium brought the team back at Las Vegas. Sorenson currently shares the ride with Joey Gase and J.J. Yeley. Richmond would mark Sorenson’s fourth start of the season in the #55, following back-to-back DNFs including a late-race accident at Bristol that destroyed the rear clip. The Richmond car was either the repaired Bristol machine or a near-identical copy of it. 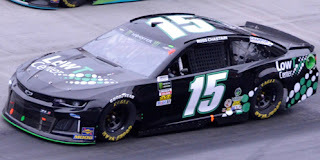 The door and roof numbers of the black Chevrolet were changed from the Michael Waltrip Racing-style digits at Bristol to the same font used on teammate Ross Chastain’s #15 Chevrolet, which finished last that afternoon. For the second-straight race, Sorenson carried primary sponsorship from VIPRacingExperience.com, a site geared toward arranging fan experiences and sponsorship packages. With the Cup field still sitting at just 38 entrants for 40 spots, Sorenson and the rest of the drivers would start Saturday’s race. Sorenson himself began the weekend searching for speed, running next-to-slowest ahead of Harrison Rhodes in the opening practice, then improving just one spot in Happy Hour, besting Rhodes and Chastain. Chastain gapped Sorenson in qualifying, ranking 30th while Sorenson sat 37th with a lap of 119.745mph (22.548 seconds). Rhodes started last in the #51 prepared by Rick Ware Racing. The XFINITY Series regular managed to keep pace in last Saturday’s Bristol race, but like Sorenson and Chastain, was eliminated in a crash. With the team’s Toyota now in need of repairs, Rhodes instead drove the team’s Chevrolet, though with the same backing from Industrial Construction Experts, Inc. The car struggled for speed early, falling 16 seconds behind the leader by Lap 12 and was lapped soon after. Sorenson, meanwhile, had issues with the #55 from the start. According to his radio transmissions, the car almost didn’t fire on the grid. The issue re-appeared by Lap 23, when the now-lapped #55 pulled behind the wall with reports of a fuel pressure issue. By the time Sorenson entered the garage and parked near the Turn 4 side of the paddock, he’d promptly taken last from Rhodes, and was losing laps by the second. Since Premium’s acquisition of Phil Parsons Racing in 2015, the team had faced this scenario no less than four times. 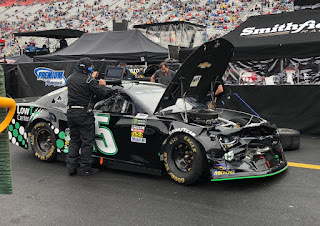 Three of those times – twice with Timmy Hill and once last year with Gray Gaulding – the #55 failed to complete the opening lap, and had to spend several laps behind the wall for repairs. But in each case (the other being Derrike Cope’s run at Fontana in 2017), the team managed to get the car pieced back together. Only one time in those five – Hill’s snake-bitten run at Michigan in 2015 due to an oil leak – did the team fail to climb out of last place. And so, for much of the race’s first half, the Todd Parrott-led crew set to work trying to get the #55 back on the track. 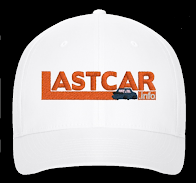 Radio transmissions indicated the crew was looking to cannibalize parts from the team’s backup car. The team looked at the fuel system, but on Lap 86 reported that the engine wasn’t turning over. The crew then looked to replace the battery, and spent several laps looking for a new one. By Lap 96, attention turned to the starter, which was also replaced while the fuel cell was inspected. The work was completed by Lap 111, during which time the right side tires had been removed and re-secured. On Lap 120, the crew pushed the car out of the garage toward the exit at Turn 2. There, on Lap 122, Sorenson returned to the action, exactly 100 laps down. Unfortunately for Sorenson, Saturday’s race took on a long green-flag look for most of its distance, its first 354 laps slowed only by the yellows at the end of Stages 1 and 2. The next-to-last-place runner of Harrison Rhodes was still on track along with the rest of the field, and was just 11 laps behind when Sorenson returned to action. Thus, if no one else retired by the 300-lap mark, it would be impossible for the #55 to gain any more spots. This ended up being the case. On Lap 297, Sorenson pulled behind the wall once more, and the crew packed up for the night. The #55 disappeared from RaceView on Lap 303. Finishing 37th was Ryan Newman, the night’s only other retiree. Newman was involved in the second of four cautions that fell in the race’s final moments, his damaged #31 Childress Vineyards Chevrolet spraying oil around the track. The finish cost Newman a spot in the Top 16 in points, joining 16th-ranked Paul Menard, who finished a disappointing 24th. Rhodes took home 36th, coming home 16 laps behind race winner Kyle Busch. In 35th was Gray Gaulding, who on the preliminary entry list was reported to welcome back Sunfrog.com as sponsor. Instead, his #23 Toyota welcomed not one, but two new food-related backers – Hibachi Box and Pepe’s Mexican Restaurant. Rounding out the Bottom Five was Landon Cassill, who despite finishing just three laps down could climb no higher than 34th in Derrike Cope’s #00 StarCom Fiber Chevrolet. *This marked the first last-place finish for both Sorenson and the #55 in a Cup Series race at Richmond since April 24, 2016, this same race two years ago, when Sorenson finished under power, 10 laps down in the Toyota Owners 400. *This is only the third time a Cup Series last-placer retired due to electrical issues. The other two occurrences were J.J. Yeley on April 30, 2011 and Scott Speed on April 28, 2012. Jeff Green picked up the 106th last-place finish of his NASCAR XFINITY Series career in Friday’s ToyotaCare 250 at the Richmond Raceway when his unsponsored #93 RSS Racing Chevrolet fell out with electrical problems after 26 of 250 laps. The finish, which came in Green’s 488th series start, was his fourth of the season and his first since Texas, two races ago. He has now finished last in every other race run since last fall's Homestead finale. In the NASCAR XFINITY Series last-place rankings, it’s the 31st for car #93, the 500th for Chevrolet, and the 45th by reason of electrical trouble. Across NASCAR’s top three series, it’s the 81st for the #93, the 1,588th for Chevrolet, and the 113th by reason of electrical issues. One week after his teammates J.J. Yeley and Ryan Sieg swapped rides following Sieg’s wreck in qualifying at Bristol, Green was himself scheduled to swap rides with Yeley at Richmond. The preliminary entry list showed him in Yeley’s #38 with Yeley in the #93. However, this was corrected at mid-week, showing Yeley in the #38 with Superior Essex returning as sponsor. Green retained the #93, though without sponsorship. Green started the Richmond weekend with a head-turning performance in Friday morning’s opening practice. Taking on fresh tires and a race setup, Green put his car 9th on the speed charts, harkening back to memories of his victory over Matt Kenseth in this same race 18 years ago. He then tweeted that he was running scuffs in qualifying and the race. After not participating in Happy Hour, Green and his older tires managed just 31st in time trialswith a lap of 115.880mph (23.300 seconds). With 40 drivers arriving for as many spots, no one failed to qualify. Starting last on Friday was the #74 Tropions / Shadow Warriors Project machine of Fontana last-placer Mike Harmon, who fielded his 2015 Dodge for the second-straight race. Harmon held the spot on the opening lap, running 6.845 seconds behind the leader at the end of Lap 1. The next time by, he’d worked his way past Morgan Shepherd and opened up just over a tenth on the #89 VisOne RV Chevrolet. Shepherd held the spot until Lap 5, when David Starr encountered trouble on his #52 Circle Track Warehouse Chevrolet. That time by, Starr fell from 37th to last, and was running noticeably off the pace. Starr and the Jimmy Means Racing crew talked over the issue, which RacingUnderdogs reported involved an electrical issue, the battery down to 14 volts, making the team think Starr hit the kill switch. The issue made Starr the first driver to lose a lap on that fifth circuit. He would continue to lose more laps as he continued to run a reduced pace. Harmon, meanwhile, was re-passed by Shepherd on Lap 5 and gradually lost touch with the #89, falling two seconds behind him by Lap 10, then five seconds back on Lap 13. The next time by, Shepherd had worked his way out of the Bottom Five, dropping Timmy Hill to 38th in the #66 Dodge. Harmon closed to within three seconds of Hill by Lap 15, when the #74 lost its first lap. At the time, Starr was still last, now nine laps down. Still struggling with his issues, Starr eventually stalled on the track, drawing the first yellow on Lap 20. He went behind the wall for repairs, which RacingUnderdogs indicated included the fuel lines as the car kept shutting off. If the problem proved terminal, it would have marked Jimmy Means Racing’s first XFINITY last-place run since 2013. As Starr’s repairs were continuing , Harmon was now five laps down and Shepherd was down two. As the only lapped machines, Shepherd got one of his laps back with the Lucky Dog. Harmon lost a sixth lap under the yellow, keeping him 39th. Through the first caution, Jeff Green had remained on the lead lap, and climbed up as far as 31st. However, on Lap 27, as the field took the restart, Green dropped to the final car on the lead lap, 6.954 seconds back of the lead. The next time by on Lap 28, Green went behind the wall, losing his first lap in the process. 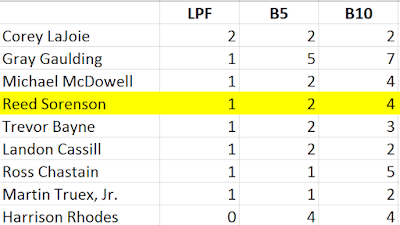 As it happened, Green went behind the wall on the exact same lap that saw both Harmon pull down pit road and Starr return to action, the latter 19 laps behind. This allowed Starr to slowly close the gap on Harmon, ultimately dropping the #74 to last on Lap 43. But Harmon wasn’t done, either. On Lap 67, his black Dodge returned to the track 44 laps behind, Just three laps behind Green, Harmon dropped Green to last on Lap 70, the final exchange for the position. Finishing 39th was Shepherd, who retired with brake issues on Lap 33. Shepherd was passed by both the returning Harmon and Starr, but was classified ahead of Green by a margin of six laps due in part to Green’s exit five circuits earlier on Lap 28. Harmon continued on, though he was up to 65 laps down by Lap 165 and still running 38th. He ended up climbing up to 36th before he was finally eliminated by clutch trouble inside the final 100 laps. The first of the two drivers Harmon passed was Timmy Hill, whose #66 Chris Kyle Foundation Dodge had the same issue as Starr with his car constantly shutting off. For Hill, the issue turned out to be the fuel pump. 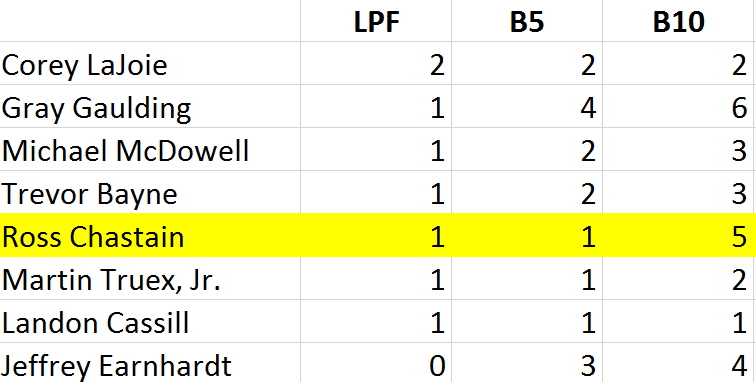 The other retiree was Stephen Leicht, whose #55 Jani-King Toyota cited brake trouble. Jeremy Clements, who finished last for the first time in his career last Saturday at Bristol, recovered nicely to finish 8th – his first top-ten finish of 2018. *This marked Green’s eighth XFINITY Series last-place finish at Richmond. It was in this race last year that Green made his first series start for RSS Racing, taking the place of Jordan Anderson. There are 40 drivers entered for Friday’s race, down one entry from last week in Bristol. All entered drivers will qualify for the race. Welcome back Jeb Burton, who this Friday makes his first XFINITY Series start since August 18, 2017, when he ran 29th at Bristol for JGL Racing. Longtime sponsor Estes Express Lines joins the effort. Burton has two previous XFINITY starts at Richmond – a pair of 19th-place finishes in 2016. Friday will also see the XFINITY Series debut of Truck Series upstart Noah Gragson. Gragson takes the place of Ryan Preece, who won a physical race at Bristol last Saturday. Currently 5th in the Truck Series standings, this will be Gragson’s first start at Richmond since September 10, 2015, when he finished 10th in a K&N Pro Series East race won by Austin Hill. Tony Mrakovich, who was swapped out for Dylan Lupton following a pair of practice incidents at Bristol, is again entered this Friday for a second attempt at his XFINITY Series debut. One week after J.J. Yeley and Ryan Sieg swapped rides following Sieg’s qualifying wreck at Bristol, Yeley was originally entered in the #93 with Jeff Green in the #38. As of Thursday, the two have switched back with Superior Essex backing Yeley's #38. Sieg remains in the #39. Ty Majeski was swept up in one of the many accidents last Saturday in Bristol, leaving him 34th at the finish. This week, he hands the steering wheel to Chase Briscoe, who slides over from the Biagi-DenBeste #98. It will be Briscoe’s first start at Richmond. Cody Ware was headed to a solid finish in Mike Harmon’s Dodge before an accident knocked him out near the halfway point. Harmon himself is driving this week, and will again field the Dodge in place of his Chevrolet. Troptions is listed as the sponsor along with the Shadow Warriors Project. Welcome back Brandon Brown, who is set to make his first XFINITY start since his family's team ran 36th in this year's Daytona opener. 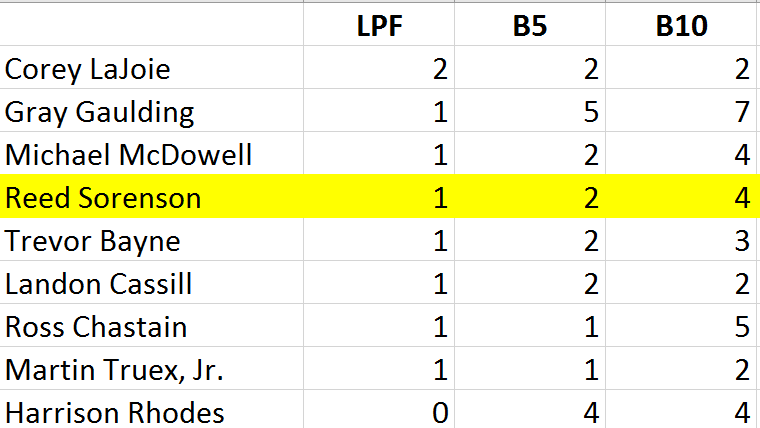 This time, Brown takes the place of Josh Williams, who ran all seven races this season for car owner Mario Gosselin with a best of 21st at Las Vegas. The #98 team is not entered this week following Chase Briscoe’s 23rd-place finish at Bristol. Briscoe moves to the #60 in place of Ty Majeski. For the second-straight XFINITY Series race, there are NO Cup Series regulars on the entry list. There are 38 drivers entered for Saturday’s 40-car field, meaning that all entrants will start the race. It’s the eighth-consecutive short field of the 2018 Cup Series season and the second-straight 38-car field at Richmond, the shortest Cup fields at the track since 1995. Eleven years after the “Free The Eight” campaign, the number returns to the Cup Series for the first time since April 5, 2009. With Dale Earnhardt, Inc. fully absorbed into Chip Ganassi Racing, the number will return under the Richard Childress banner as a part-time third team (their second start will be on the Charlotte “Roval” in October). 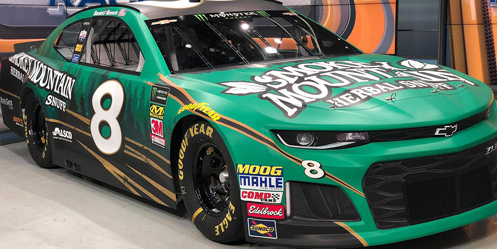 Driving the Smokey Mountain Herbal Snuff machine is XFINITY Series regular Daniel Hemric, who last year made the championship four at Homestead. Hemric, currently second in this year’s XFINITY Series rankings, finished 3rd and 4th in the series’ two trips to the track last year. He will run double-duty on Friday with RCR's #21 car in XFINITY. Last week in Bristol, Gray Gaulding’s #23 had noticeably fewer decals for sponsor Earthwater as both the hood and rear decklid only carried a sticker for BK Racing itself. 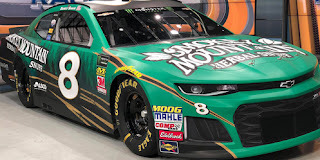 This week, the team welcomes back Sunfrog.com, which backed Gaulding for five races last year, most recently at Talladega. UPDATE: Sunfrog.com did not sponsor the #23, and was instead replaced by new backers Hibachi Box and Pepe's Mexican Restaurant. As with Shane Lee's XFINITY debut last week, Ryan Newman will be sponsored by Childress Vineyards. This points to continued sponsorship issues at RCR, following Newman's Chevrolet Accessories backing at Fontana. 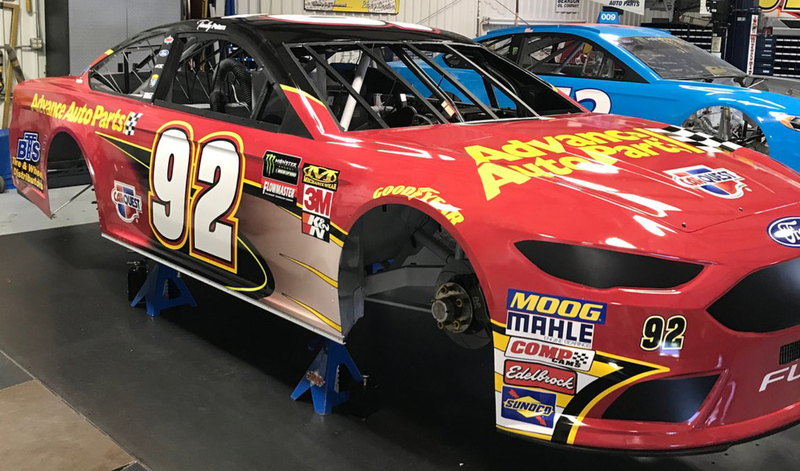 Go FAS Racing welcomes sponsorship from Superior Logistics Services, Inc., which last year backed the efforts of Circle Sport with The Motorsports Group’s #33 Chevrolet. Driver Matt DiBenedetto, who comes off finishes of 16th at Texas and 21st at Bristol, has a best Richmond finish of 28th in this race last year. Joining the #43 team after Darrell Wallace, Jr.'s strong run at Bristol is Food Lion, a grocery chain that hasn't been a primary sponsor on a Cup car since May 24, 1992, when they backed Dave Marcis at Charlotte. Harrison Rhodes found himself in the middle of one of Bristol's biggest wrecks on Sunday, destroying his Toyota. He will instead drive a Chevrolet this weekend. Industrial Construction Experts, Inc. will back the effort for a second-straight race. At Bristol, Corey LaJoie averted his third-consecutive last-place finish of the season and finished 25th, his best run since Pocono last August. Nevertheless, Cole Whitt returns to the seat of the #72 Chevrolet this weekend. Whitt’s best of 7 Richmond starts was a 27th-place finish for TriStar in this race last year. After back-to-back starts on the short tracks with finishes of 28th and 27th, Gaunt Brothers Racing has not fielded a car for D.J. Kennington this week. However, the hood from their Bristol car fetched $12,000 on Wednesday in a benefit supporting the Humboldt Broncos. Expect GBR to return at Talladega next week as the team last year focused on the restrictor-plate races. With strong finishes of 21st and 20th in his last two starts, Landon Cassill is again entered in Derrike Cope’s #00 Chevrolet this weekend. The team originally listed the return of VRX Simulators as sponsor, but instead Richmond will mark the 2018 debut of the StarCom Fiber paint job the team used in their first races last year. On Tuesday, it was reported that Joey Gase will drive the #00 at Talladega. Cassill's plans are still to be determined. The return of the Truck Series is now two weeks away. A failed oil seal was the listed cause of exactly one last-place finish in NASCAR history. It occurred on May 29, 1983 during the World 600 at Charlotte. 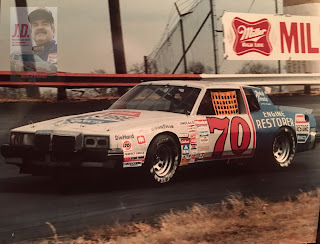 The late Ron Bouchard, who pulled his stunning upset victory at Talladega two years earlier, had qualified 27th in the field of 41 driving Jack Beebe’s #47 Race Hill Farm Buick. His race ended with “oil seal” in the results after just 14 of the 400 laps, three circuits before Tim Richmond’s engine let go. It was the first of only two last-place finishes for Bouchard in 160 career starts. The second occurred at Atlanta on November 2, 1986, this time when his own engine let go after 40 laps of the Atlanta Journal 500. J.D. 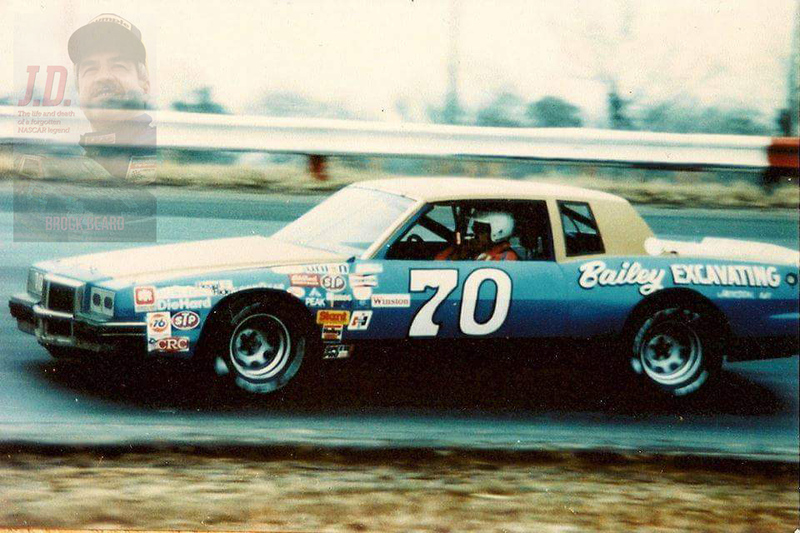 at Richmond in 1981, one of his first downsized Pontiacs. One of the most interesting measures of J.D. McDuffie’s longevity in the sport is his career at the Richmond Raceway. McDuffie made 39 starts at the track, during which time he made at least one start on all five of its configurations. Pearson. His last start on the dirt came that September, where this time he ran 24th of 29. On September 8, 1968, McDuffie was in the 28-car field that was the first to run on the track’s new pavement. He was also the surface’s first last-place finisher, his 1967 Buick losing oil pressure after 12 laps of the Capital City 300. The track, now known as the Virginia State Fairgounds, was now measured at 0.625 of a mile. By his next start on April 13, 1969, it was the Richmond Fairgrounds Raceway and again measured as an exact half-mile. McDuffie finished 6th that day, his first Top Ten at the speedway. A second last-place run came that September, this time due to engine failure. That race marked the first time the Fairgrounds was measured at 0.542 of a mile, its official size for nearly two decades. 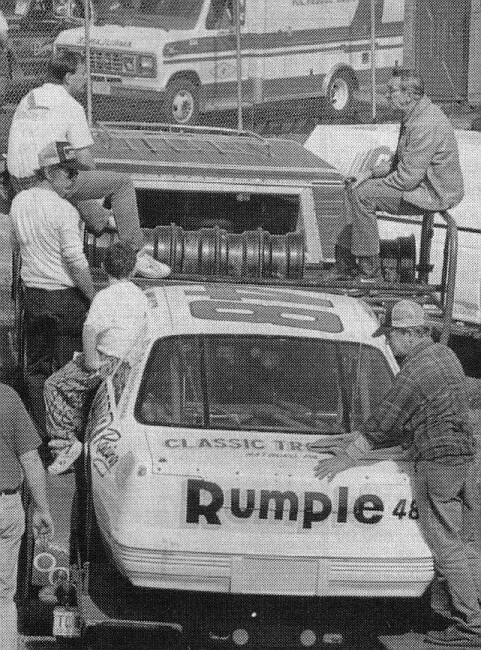 Richmond 1986, Rumple Furniture and foil numbers. and backing from Tom Winkle. McDuffie finished last four times at Richmond. His third of these took place on September 10, 1972, when the transmission let go after 3 laps. That day, McDuffie wasn’t driving his own #70, but a 1970 Plymouth fielded by Doc Faustina. From 1971 through 1976, Faustina would field cars for several stars of the sport, including Richard Childress, Harry Gant, and the final Cup car Hall of Famer Wendell Scott drove at Charlotte on October 7, 1973. The 1972 Richmond race was McDuffie’s only start for Faustina. 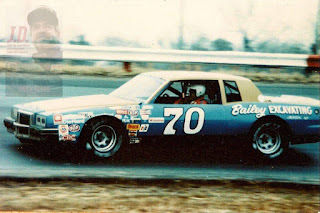 McDuffie’s final last-place run at Richmond took place on September 7, 1980, when a cylinder head issue knocked-out his Bailey Excavating Chevrolet after 44 laps. This finish had historical significance of its own. On that day, he broke a tie with fellow owner-driver G.C. Spencer for the most last-place finishes in NASCAR Cup Series history. McDuffie would hold this record well after his passing. Joe Nemechek exceeded his career mark in 2014. In all, McDuffie scored eight Top Tens at Richmond and a single Top Five. The latter occurred on October 12, 1975, during a 500-lapper won by Darrell Waltrip. McDuffie finished 5th that day in a car sponsored by the Butler’s, Inc. and Glenn’s Landscaping. His 1975 Chevrolet finished 17 laps down to Waltrip, but was ahead of the likes of Benny Parsons (18th), Cale Yarborough (26th), and Richard Petty, who finished 28th and last due to engine failure. McDuffie also led his only two laps at the track on March 11, 1979 en route to a 7th-place finish. McDuffie made just one Cup start on the current 0.75-mile configuration. On September 10, 1989, at what was then the Richmond International Raceway, his #70 Rumple Pontiac lined up 32nd in the 36-car field, having bested Greg Sacks for a spot in the field. He finished 31st in that day’s running of the Miller High Life 400, an event dominated by Rusty Wallace. In each of his final three attempts to make the Richmond field, McDuffie was the fastest car to miss the field. This included the 1991 running, when he brought the same dark blue Pontiac to the track that had barely missed out on the Daytona 500 field a week earlier. This weekend, Richmond debuts yet another new name as "Richmond Raceway" with a new infield. It will be the first incarnation of the facility where McDuffie has not raced.